DUBAI, United Arab Emirates â Nov. 18, 2013 â Northrop Grumman Corporation (NYSE:NOC) and the United Arab Emirates' Higher Colleges of Technology (HCT) have signed a Memorandum of Understanding (MOU) to continue their highly successful science, technology, engineering and mathematics (STEM) partnership known as Innovation Challenge into 2014. "Northrop Grumman is committed to strengthening science, technology, engineering and mathematics education and to encourage student interest in STEM-related programs and careers," said Doug Raaberg, chief executive UAE, Northrop Grumman. "We are proud to sponsor this challenging competition that encourages innovation among students in the UAE." Starting with the first Innovation Challenge event in 2011, HCT students have gained practical experience in designing, building, and testing a model-sized, unmanned aerial vehicle under the guidance of Northrop Grumman engineers. 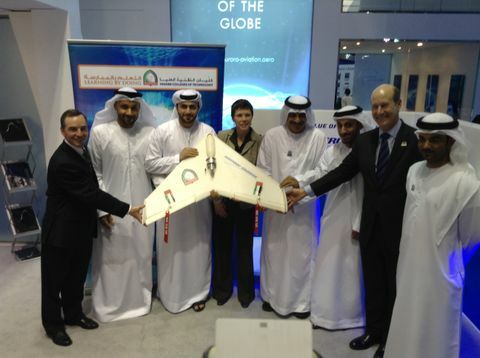 "Northrop Grumman is proud to actively sponsor and participate in an initiative such as Innovation Challenge, which encourages Emirati students' creativity while also teaching valuable technical skills," said Mary Petryszyn, vice president, International, Northrop Grumman Aerospace Systems. "The UAE Innovation Challenge ensures that knowledge and technology is actively passed on to younger generations, which leaders in the UAE have emphasized as an important element of the country's future. It is a perfect example of Northrop Grumman's commitment to cultivate widespread literacy in science, technology, engineering and mathematics by encouraging student interest in STEM programs and careers, especially among females and other minorities." The MOU further expands Northrop Grumman's focus on domestic and international educational programs aimed at deepening student interest and appreciation for STEM programs and careers. "The 2014 Innovation Challenge will build on the great success of the previous events and we will see our students, both male and female, demonstrate how they are able to utilize the knowledge they gain in their courses in such a practical and hands-on manner," said Dr. Tayeb Kamali, HCT vice chancellor. "This competition is a clear example of HCT's learning-by-doing philosophy and we appreciate Northrop Grumman's continued commitment to our students." Following months of mentoring by Northrop Grumman engineers, the HCT student teams will compete in a flying competition, open to the public, April 22-23, 2014 at the Zayed Cricket Stadium in Abu Dhabi . Student teams are judged on specific criteria in the flying competition and must provide an oral presentation on the design and build of its UAV. The winning team will receive an all-expense paid trip to the United States where they will tour Northrop Grumman facilities on the West Coast as well as educational institutions with specialties in robotics and other areas of interest.